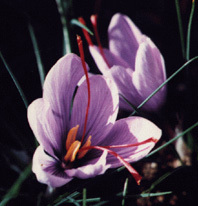 Saffron crocus, Crocus sativus L.
Many cultures have a long history of knowledge of the natural world around them, including the identification and uses of plants. And each culture names plants in its own language. These common names are quite stable and useful in their place of origin, but are not of much use elsewhere. In other places the same plant might have a different common name, or the same name might apply to a different plant. In order to organize the plant kingdom according to the relationships between plants, and to provide a stable and universal set of names, botanists use a system called Binomial Nomenclature. This was first developed by Linnaeus in the 1750's, and the hierarchical system of classification he applied to all the known organisms of the plant (and animal) kingdoms is the basis for the organization used today. The names of plants may be changed as their relationships become better understood, but name changes can be tracked down so it is possible to know if two different names refer to the same plant. Each species of plant is given a two-word name (a "binomial") in Latin. The first word, a noun, is the name of the genus the plant belongs to. The second word (called the "specific epithet"), often an adjective, distinguishes the species from the others in the genus. Under the rules of nomenclature, the same binomial cannot be used twice; that is, no plant may have the same name as any other plant. Sometimes it happens, however, that two people unknowingly use the same name (though in the end, only one of them will be allowed to stand). To make it unambiguous which name one is referring to, botanists add the name of the author to the name of the plant. In nonscientific works the name of the author is usually not needed. So the scientific name of the onion is Allium cepa L. The "L." is for Linnaeus, who named it. Garlic is Allium sativum L. You can see that they are related, because they are in the same genus, Allium. Onions, garlic, shallots, and leeks, both wild and cultivated, are all in the same genus. The singular and the plural of the word "species" are the same (just like "series"), but the abbreviations are different--sp. and spp., respectively. If you can tell that a plant is in the genus Allium, but you don't know which one it is, you can call it Allium species (or "Allium sp.") If you are referring to several different members of the genus, you can call them Allium species (or "Allium spp."). A species might have different types that have developed naturally in the wild (called subspecies or varieties) or that have been developed in cultivation (called cultivars). The name of the variety can be added to the binomial, with the abbreviation "var." or "ssp." or "cv." as the case may be. (Or for cultivars, simply appended in single quotes.) For example, there is a wild onion in the Mojave desert called Allium fimbriatum var. mohavense . The genus name is capitalized and all the others are lower case. You will still occasionally see the specific epithet capitalized if it is a person's name, but this custom, though still permitted, is no longer generally followed. The Latin portion of scientific names--that is, the two or three Latin words, but not the author or the abbreviations "var. ", etc.-- should be itialicized if in print, or underlined if handwritten. However, the constraints of email communication have forced botanists to write plant names in the same type as the rest of their message, and this seems to cause no confusion whatever. Just as closely related species are grouped together into the same genus, related genera are grouped into families, families into orders, and so on. When people say two plants are "closely related" they usually mean they're in the same genus, and when they say "related" they usually mean they're in the same family. Another source of confusion about plant families is the fact that different people group things differently. For example, some taxonomists consider the lily family to be huge and inclusive, and some split it up into lots of smaller families. So you may see onions put into the lily family, or the amaryllis family, or in a family of its own, the onion family. Just remember that no matter how people organize the families, if you have Allium cepa, you have an onion. Chop it, saute it, and enjoy! The best reference in existence for finding plant names and interesting information about every plant on the planet is The Plant-Book by D. J. Mabberley. It is published by Cambridge University Press, 1987. ISBN 0 521 34060 8. It is a compact dictionary-style reference. You can look up any plant product and find out what plant it comes from. Most common names, not only English, are also listed. For every genus it tells you the family. For every family the identification characteristics and also notable members of the family and other intersting facts. A great book! I have a copy at home and one on my desk at work and I use it every day.